It started with the national anthem and ended with a rap. In between came a poignant minute’s silence, politicised football chants and a call to action by the woman tipped to become the first Green national leader on the planet. The unveiling in São Paulo of Brazilian presidential candidate Marina Silva’s platform for government on Friday was a sometimes bizarre mix oftradition and modernity, conservatism and radicalism, doubt and hope: but for many of those present, it highlighted the very real prospect of an environmentalist taking the reins of a major country. In a dramatic election that has at times seemed scripted by a telenovelawriter, Silva has tripled her coalition’s poll ratings in the two weeks since she took over from her predecessor and running mate, Eduardo Campos, who was killed in a plane crash. Following a strong performance in the first TV debate between candidates, polls suggest she will come second in the first-round vote on 5 October and then beat the incumbent, Dilma Rousseff, in the runoff three weeks later. This is a spectacular turnaround for a candidate who did not even have a party a year ago, when the electoral court ruled that she had failed to collect enough signatures to mount a campaign. It was also the latest in a series of remarkable steps for a mixed-race woman who grew up in a poor family in the Amazon, and went on to become her country’s most prominent advocate of sustainable development. The distance Silva – known as Marina – has come from her remote forest home was evident at the launch of her programme for government in the affluent Pinheiros district of São Paulo. 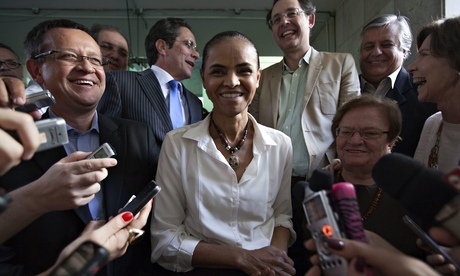 About 250 people – mostly from her Sustainability Network party and its allies in Campos’s Brazilian Socialist party (PSB) and other groups – gathered under the chandeliers of the swanky Rosa Rosarum venue, where waiters in white gloves served canapes, while they waited for their leader. The surge in the polls has been exhilarating for supporters. A month ago, as running mate to Campos, the PSB ticket struggled to hit double digits. Within a week of succeeding him, Silva more than doubled the support rate, pushing her into contention for second place and a runoff vote against Rousseff. On Friday, her ratings jumped again. A Datafolha poll showed Silva was now neck and neck with the president at 34% in the first round and would win comfortably with 50% of the vote if it went to a second round, compared with 40% for Rousseff. Silva’s face stares out from the covers of magazines and the front pages of newspapers, under headlines such as “Marina Presidente?”, “How far can Marina go?”, “The Marina Effect”. One cartoonist depicted her as a Neo-type character from The Matrix who appears to be fighting the campaign in almost another dimension from her rivals. When the candidate arrived, she stepped out from her van and immediately disappeared into a scrum of cameras and reporters. Local media have described the 56-year-old as frail and noted her low weight and height – details that are almost never mentioned for male candidates. 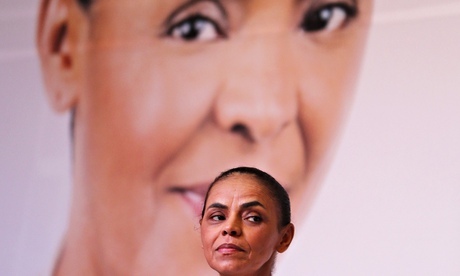 Women are hugely under-represented in Brazilian politics, but it is not because of her gender that Silva could break the mould. That has more to do with the colour of her skin and ideas. Silva is a mix of Brazil‘s three main ethnic groups. Among her ancestors are native indians, Portuguese settlers and African slaves. While she is usually described as predominantly “indigenous”, friends say Silva categorises herself as “black” in the national census. In Brazil’s white-dominated political world, this is exceptional. “It will be super-important for Brazil to have a black president, as it was in the US with Obama. It would signify a big advance for our country against discrimination,” said Alessandro Alvares, a member of the PSB and one of the few non-white faces in the room. Silva’s political colours could prove still more controversial. For more than a decade, she has been known as the country’s most prominent Green campaigner, having first worked on sustainability at the grassroots with the Amazon activist Chico Mendes, who was later murdered. She later served as environment minister in Luiz Inácio Lula da Silva’s administration from 2003 to 2008, when she put in place effective measures to slow the deforestation of the Amazon. In her address to Friday’s meeting she stressed that Brazil could double its output of crops and meat without further clearing of the rainforest. The clean, green image played well with university students, women and other young voters when Silva first ran for president in 2010. Although she was then with the Green party, which had only a tiny campaign machine, little funds and scant TV time, Silva came third with 20m votes – more than any green candidate has secured anywhere in the world before or since. This time, she is aiming for a winning share of the electorate and has widened her message accordingly. She has also chosen a running mate – Beto Albuquerque, a congressman from the southern state of Rio Grande do Sul – who has close ties to agribusiness. Listening to Silva speak as the leader of a mostly elite, mostly white, urban crowd in Latin America’s biggest city, it is remarkable to think of her very different origins in the Amazon. The would-be president grew up in the forest in a poor, illiterate family of rubber tappers. She survived malaria and hepatitis, worked as a housemaid and didn’t learn to read until she was 16. With the support of radical Catholic priests she became involved in social issues, entered university and became a student and union activist. In her childhood, she once harboured ambitions to become a nun. Now she is a twice-married mother of four, but still comes across as serious and severe to the point almost of asceticism. Parts of her speech are stabbed out in a series of finger jabs. Mostly though, it is delivered with the intensive haste of a teacher who has to get through a lot of material in the last class of term. Or a woman on a mission. It is intense: despite the occasional joke and pause for applause, she lacks the easy bonhomie of former president Lula. Crowd-pleasing has never been what Silva is about. Throughout her career, she has put her principles above the priorities of her political allies. This is one of the reasons why she is now effectively on her fourth party. It has also led to criticism that she is selfish, autocratic, a loner and too much of an idealist to get things done. A more generous interpretation is that she is an outsider who has never been able or willing to conform to the norms of the cosy world of Brasília. That is clearly part of her appeal to an electorate that is tired of business as usual. Many of those who support her were among the protesters who joined the million-strong demonstrations of more than a dozen cities last year. But, now in a coalition, Silva is making compromises. Her 250-page programme for government, which was launched on Friday, attempts to reconcile the very different outlooks of the Sustainability Network and the more pro-business PSB. The result is a something of a hodge-podge, with something for street protesters (10% of GDP to healthcare within four years), financial markets (greater autonomy for the central bank) and her core supporters. On the environmental front, the programme calls for greater energy diversity, which will mean the promotion of wind and solar power; more ethanol production; the maintenance of hydrogeneration (which currently supplies more than three quarters of Brazil’s electricity); and the scaling back of thermal power and exploitation of mine oil deposits located in “sub-salt” strata deep under the Atlantic. The change could be dramatic, but for the moment, it lacks specifics. In her 20-minute speech in São Paulo, Silva criticised the thinking behind the Belo Monte dam, which will be the biggest in Latin America once it is finished, but stopped short of saying either it or any of the other controversial hydropower projects in the Amazon would be halted. Similarly, she was cautious about accepting the “Green champion” role that many conservationists around the world would like her to play if she became president. “Sustainable development is a global trend that can be seen in China, India and elsewhere. If I win, of course I want to make Brazil a symbol of that trend. It won’t just be us, but we have enormous potential,” she said. But many still see the would-be president as confrontational. Several senior members of the PSB resigned when she was selected as candidate. Business leaders, particularly in the powerful agricultural and energy sectors, see her as anti-development. Some fear Silva would be socially conservative as a result of her evangelical faith, and the opposition to abortion and gay marriage that comes with it. But associates say she is not dogmatic on these issues. One of the loudest cheers of the launch meeting followed an affirmation of support for the rights of the lesbian and gay community. Germano Marino, the president of the Acre Homosexual Association and a member of the ruling Workers’ party, told the Observer he would vote for Silva despite her evangelism. Victory is far from certain. With more than a month left before the election on 5 October, there is abundant time for another twist in the campaign. Voter sympathy following the death of Campos may wear off. Attacks from rivals will increase. And the other candidates should benefit from their superior financial backing and TV time. But, for now at least, all the momentum is with Silva and her diverse group of supporters. As she heads towards the first-round vote on 5 October, she has generated support among environmentalists, financiers and street protesters; mixed feelings among gay voters and anti-market leftists; and outright hostility from many in the agribusiness and energy industries. So what does Silva stand for? The traditional political labels of left and right do not quite fit, nor do the ethnic categories of black and white. Green is certainly an important part of the mix, though how diluted will probably not be clear until this unusually colourful campaign comes to an end.